The two teams meeting for the NFL Championship on December 15, 1946 were no strangers to postseason action but were bouncing back from down years in ’45, the last World War II-affected season. The Bears, owned and coached by George Halas who had gone off to the Navy himself, were a solid club led by 30-year-old QB Sid Luckman (pictured at right) and featuring a deep backfield. From a 3-7 showing in 1945 – the team’s first losing record since 1929 – Chicago bounced back to 8-2-1 in topping the Western Division. Head Coach Steve Owen’s Giants had been 3-6-1 the previous year but rose to the top of the Eastern Division in ’46 at 7-3-1. The addition of tailback Frank Filchock, who had split time with the great Sammy Baugh in Washington for six years, helped rejuvenate the offense while the defense was tough, especially on the line. They had beaten the Bears the previous month, but injuries were a factor as FB Bill Paschal was out with a broken jaw. There was an extra element of drama before the teams took the field. On the morning of the game, it was revealed that Giants FB/DB Merle Hapes, who was slated to start in place of Paschal, was being suspended by Commissioner Bert Bell for failure to report an attempted bribe for the purpose of throwing the title game. While Hapes had rejected the offer, his failure to inform officials of the offer resulted in his suspension. Filchock, who had also been named, denied being approached and was allowed to play against the Bears. The news had already broken publicly before the game was played and some in the record crowd of 58,346 at the Polo Grounds booed Filchock when the Giants took the field. Things did not start out well for the home team as the Bears scored twice in the first nine minutes. First, following a fumble recovery by LB Stu Clarkson, Luckman threw to end Ken Kavanaugh for a 21-yard touchdown and then HB Dante Magnani intercepted a Filchock pass and returned it 19 yards for a TD. The Bears were ahead by 14-0. The Giants got on the board before the opening period was over. Filchock, playing with a broken nose, capped a 52-yard drive by tossing a pass to end Frank Liebel that covered 38 yards for a touchdown and Chicago’s margin was cut to 14-7. It remained that way through a scoreless second quarter. New York got a break in the third quarter when Bears FB Joe Osmanski fumbled and end Jim Lee Howell recovered for the Giants at the Chicago 20. Three plays later, Filchock threw a five-yard TD pass to FB Steve Filipowicz and, with the successful extra point, it was a tie game at 14-14 heading into the final period. Early in the fourth quarter, the Bears drove into New York territory as Luckman passed to HB George McAfee for 17 yards and end Jim Keane for 16. With the ball at the 19, Halas gave the word to his star quarterback, who rarely ran the ball, to utilize a specially-designed play that he was holding for the right occasion. Luckman faked a handoff to McAfee on an apparent sweep and, with the defense shifting accordingly, he trotted to his right with the ball at his hip and then took off on a bootleg. It worked to perfection as Luckman, who hadn’t scored a rushing touchdown during the regular season, broke a tackle at the 10 and made it to the end zone. The TD put the Bears back in front and seemed to deflate the Giants. Frank Maznicki added a 26-yard field goal before it was all over and Chicago came away with the NFL Championship in the hard-fought game by a score of 24-14. Total yards were virtually even, with the Giants holding the edge at 248 to 245. New York also had 13 first downs to Chicago’s 10. However, New York also turned the ball over a staggering eight times, to three turnovers by the Bears. Sid Luckman completed 9 of 22 passes for 144 yards with a touchdown and two interceptions, had the one key rushing TD, and also had a good day kicking the ball, with his seven punts averaging 42.4 yards and helping the Bears in the battle for field position. Chicago’s top four rushers were all bunched together, with HB Hugh Gallarneau leading the way with 24 yards on 6 carries, FB Bill Osmanski gaining 23 yards on 9 attempts, brother Joe Osmanski carrying 8 times for 20 yards, and FB Don Perkins adding 18 yards on four rushes. George McAfee only ran for two yards on 6 carries but led the club in pass receiving with four catches for 57 yards. Ken Kavanaugh had 53 yards and a TD on his two receptions. 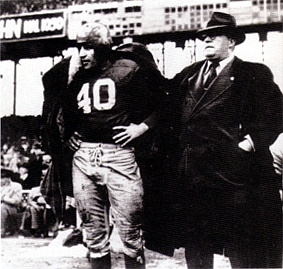 Frank Filchock (pictured below with Coach Steve Owen) was under a heavy rush from the Bears defense throughout the contest and had to utilize his mobility to find time to throw. As it was, he was successful on 9 of 26 of those throws for 128 yards with two touchdowns but also six interceptions. With injuries, plus a suspension, affecting the available backs, wingback George Franck led the Giants in rushing with 55 yards on 6 attempts. End Jim Poole caught four passes for 40 yards and Steve Filipowicz, in addition to his 9 carries for 20 yards, gained 41 yards and scored a TD on two pass receptions. In the trial of Alvin Paris, the gambler who attempted to fix the game, Filchock admitted to having lied about not being approached to throw the contest, having rejected the offer and wanting an opportunity to prove himself in the game (he was generally given credit for playing well, despite the interceptions). Commissioner Bell indefinitely suspended both Hapes and Filchock, although both were eventually reinstated (in 1954 and 1950, respectively). They played in Canada in the interim but, except for one appearance by Filchock at the end of the 1950 season with the Colts, neither was active in the NFL again. 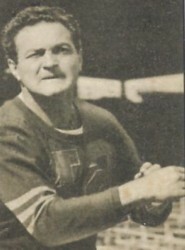 Filchock went on to both play and coach in the CFL and eventually became the first head coach of the new American Football League’s Denver Broncos in 1960. The Bears went 8-4 in 1947 and finished second to their crosstown rivals, the Chicago Cardinals, in the Western Division. New York dropped much further, going all the way to the bottom of the Eastern Division at 2-8-2. Neither club appeared again in the postseason until 1950, when each tied for first in their respective divisions. Having met in four title games, they would next face off against each other in a NFL Championship game in 1956.